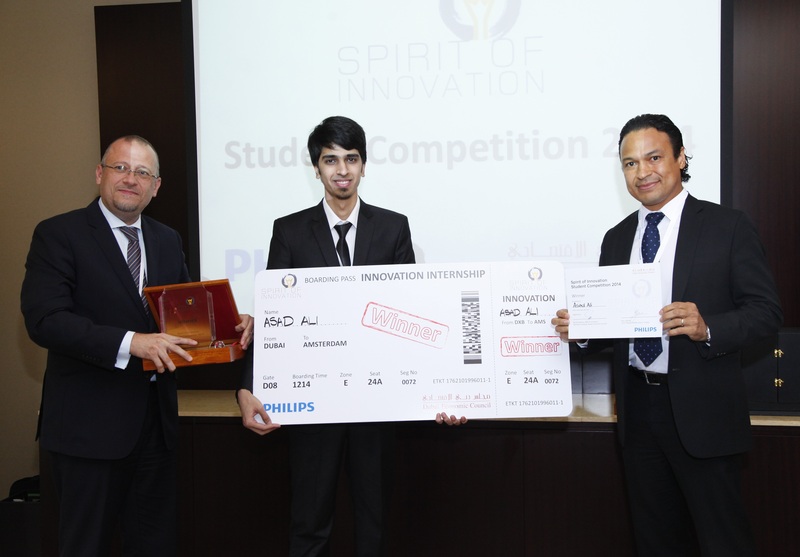 Dubai, UAE: Philips and the Dubai Economic Council (DEC) have announced the winner of the UAE student competition &apos;Spirit of Innovation’. Asad Ali, a recent graduate from New York University Abu Dhabi, stood out amongst a group of 10 finalists following an intensive day-long series of elevator pitches of their innovative ideas to the judging panel. Asad Ali&apos;s entry that aims to reduce road accident related casualties through the use of automated smart accident detection and notification service, was selected due to his impressive use of innovation to provide a solution to the leading cause of death in the UAEi. Judges were impressed by Asad’s ability to present a solution which would have a significant impact on the community at large by helping save and improve the lives of many who at risk on the roads. There were 463 traffic accident related deaths in the UAE over the first eight months of 2014, according to data released by the Traffic Coordination Department at the Ministry of Interior (MoI)ii. Manan Sharma and Sahil Sakhir from BITS Pilani Dubai qualified as runner-up and highly commended respectively. 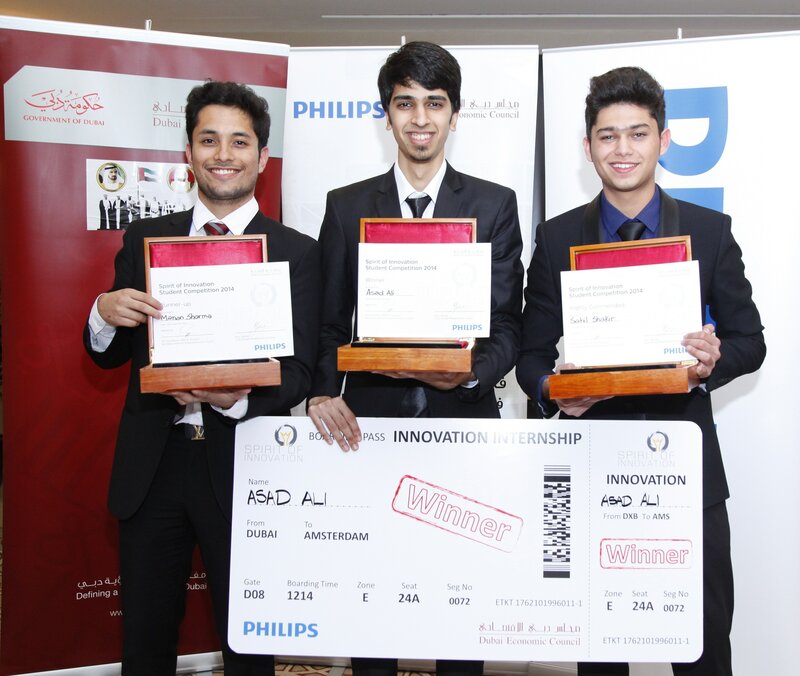 The &apos;Spirit of Innovation&apos; competition was created by Philips and the Dubai Economic Council to raise awareness of the importance of innovation amongst UAE’s future leaders whilst highlighting the value of collaboration, leadership, strategic thinking and discovery of creative potential. Asked to submit innovative solutions towards solving the UAE&apos;s challenges related to energy efficiency, healthcare, personal health and well-being, students’ submissions were evaluated on criteria such as originality, social impact, sustainability, commercial feasibility and a compelling argument. Committed to developing sustainable solutions, for the UAE’s current and future challenges, as well as fostering local talent, Philips will send Asad Ali to embark on a month-long internship at the company’s headquarters in the Netherlands, shadowing some of the world&apos;s leading innovators. &apos;&apos;As a technology company focused on improving people&apos;s lives through meaningful innovation, the Spirit of Innovation initiative is a great opportunity for Philips to support the Dubai Economic Council’s vision to promote the Emirates in becoming a centre of excellence in the future.&apos;&apos; said Roy Jakobs, CEO, Philips Middle East & Turkey. &apos;&apos;We believe that public private partnership is the way forward to foster innovation in the region, and we are confident that this initiative will be successful in tapping into the potential of the UAE youth&apos;&apos; he added. A highlight of the event was the presence of 10-year-old child prodigy and Emirati inventor Adeeb Al Blooshi who emphasized on the importance of innovation. In his words, “Innovation is the way forward, and the way forward leads to the next generation - and the next generation is the future of the UAE." The Spirit of Innovation&apos;s distinguished jury comprised of Fatma Al Janahi, Director of Strategy & Excellence, Knowledge and Human Development Authority; Tarek Hajjiri, Director Legal Policy, Dubai Economic Council; Omar Obeidat, Partner and Head of Intellectual Property Al Tamimi & Co.; Matthew Ranson, Leading Brand Consultant and founder of RANSON; Ugo Mosanya, Senior Director, Head of Strategy & New Business Development, Middle East & Turkey Philips. The 'Spirit of Innovation’ community competition is an initiative launched by Philips and the Dubai Economic Council (DEC) in May 2014. The competition was established to encourage adoption of open-innovation strategies in the UAE, by asking university students to develop sustainable solutions for the country’s current and future challenges in both energy efficiency, healthcare, personnel health and well-being. The aim of the ‘Spirit of Innovation’ is to raise awareness of the importance of innovation amongst UAE’s future leaders while highlighting the value of team work, leadership, discovering creative potential and strategic thinking.